Could an era of self-determination be underfoot? August 23, Amman, Jordan – The Global Summit sixth biennial will be held in Amman, Jordan September 9-12 making it the first of the world-touring series to be held in the Middle East, with 2018 theme, “Beyond Borders: there is a solution”. 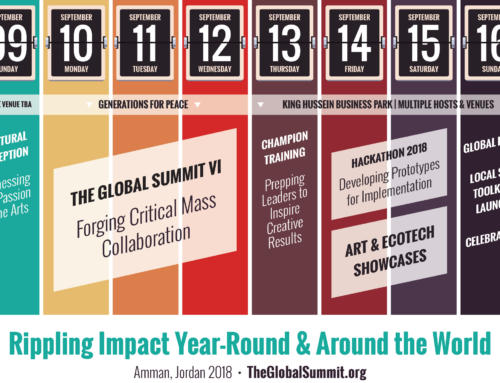 Launched in San Francisco in 2008, and held every other year since, The Global Summit (TheGlobalSummit.org) is a collaborative platform uniting cross-sector leaders working for a more sustainable, economically robust and socially just future – for all. Opening September 9 with remarks by UNESCO Global Goodwill Ambassador, HRH Princess Dana Feras, the invite only forum will be held principally in Al Hussein Youth City in Amman, Jordan at Generations For Peace through September 12. Turning outcomes into impact, a hackathon and public Future Faire will be held over the following weekend at King Hussein Business Park. On September 16th, a final solution showcase drums up inspiration for Global Goals Week, delivering local tools and a challenge to achieve the 17 Sustainable Development Goals (SDGs) – the world’s 2030 targets to resolve poverty and ensure a sustainable future, ratified by the United Nations in 2015. Across venues, The Global Summit VI will make regional green event history as the first event to implement the Arab version of ISO 20121, a set of guidelines which was established by the International Organization for Standardization, best international practices and minimal environmental impact in event management. First implemented at the 2012 Olympic and Paralympic games in London, the ISO 20121 green event standards were translated by the summit’s local green team facilitators, Yasser Al Sharif and Buthaina Aburoza. Other Notable Jordanian leaders include H.E. Marwan Juma of Oasis500; New York Times | Voices of Jordan author Rana Sweis, Mohammad Asfour of the World Green Building Council, Dr. Salma Nims of the Jordan National Commission for Women, Dr. Sami Hourani of Leaders of Tomorrow; Nadia al Saeed, who was named the “Most Powerful Arab Business Woman” by Forbes Magazine; . International Voices include UNDP Country Director Sara Ferrer Olivella, Impact Hub founder Jonathan Robinson; the Ambassador of Sweden to Jordan H.E. Erik Ullenhag; UNICEF Innovation Specialist Dr. Robyn N. Lui; author Roné de Beauvoir and more. A refuge for displaced people across a turbulent region, Jordan struggles to realize self-determination and see it’s own talent flourish in the crossfire of foreign interests. 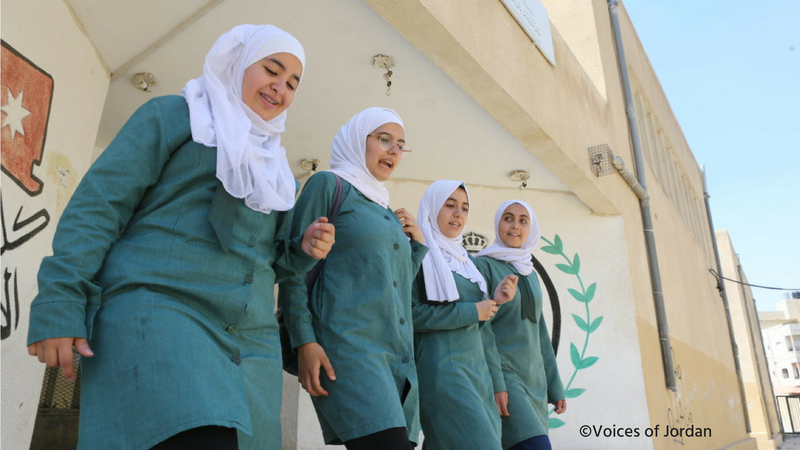 Amman 2018 breaks down silos to fosters transformative dialogue on these issues with Jordanian, Arab, and international voices from the grassroots level through to policymakers and business leaders. Uniting ideas and skills over three days of interactive sessions, all delegates work to identify and bolster local initiatives that promise measurable, long-term results within in their respective Impact Streams: Living Well, Education 4 All, Feminomics, and Thriving Cities. By the end of day three, participants are challenged to select a Policy, Technological, and On-the-ground Champion from within their Stream for the follow-on hackathon. Bringing new insights to the world, Arabic and English will be spoken throughout the Summit. Main stage sessions will have simultaneous interpretation, be live-streamed and televised through the Arab Broadcast Service and other networks. The highly facilitated forum is limited to 200 impact leaders working across Arts, Education, Media, Government, Business, Technology, and Philanthropy. TheGlobalSummit.org/application. 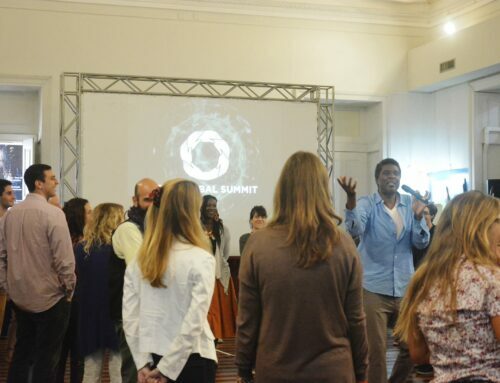 The Global Summit is facilitated by Empowerment WORKS and brought to life by Partners in Empowerment. Arabic Inquiries Farah Hamam, Media and Communications Officer of Generations For Peace Email: Press@TheGlobalSummit.org T: +962 6 500 4600The event is organized by California based sustainability think-tank, Empowerment WORKS in collaboration with many inspiring partners. Launched in San Francisco in 2008, The Global Summit is timed to follow the Summer Olympics and was held London in 2014 and Rio de Janeiro in 2016. Global Summit delegates will examine four Impact Streams and make recommendations at the conclusion of the event, and have the opportunity to continue their work for several more days at the end of the Summit in the Hackathon, a special follow up that will be hosted at the King Hussein Business Park. With over 60% of people destined for the metropolis, what will it take for humanity to thrive? What is the role of art & culture? In the context of the ever rapidly changing urban landscapes of Jordan and the communities in transition across the region, we’ll explore leading edge innovations, and ancient cultures have integrated energy, waste, water and the built environment to create meaningful work and play. Co-create economics that work for all – from Micro Finance to Fortune500s. 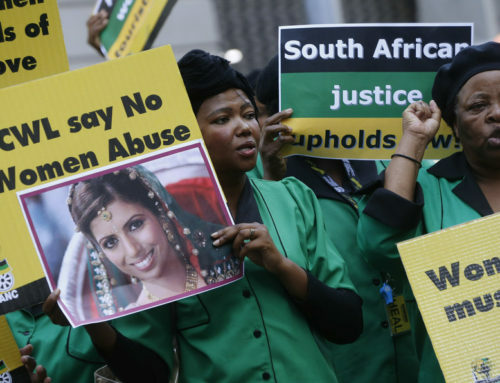 Explore how the intersection of women’s leadership, feminine values, legal systems, new business models and high impact investing can drive a more inclusive economy. Connect and share practices, technology and tools to move us toward a just and flourishing world. What does it take to live well? What does it take to be healthy? Health of our own bodies & minds is closely related to the health of those around us, the plants and animals, the health of society, and our connection to God. How might we combine ancient methods and new technology to creating a culture that invests in and supports a holistic way of being and living – in body, mind and spirit. Discussions will range from sourcing real food to cultivating vitality to empowered living. EDUCATION FOR ALL: Lifelong. Equitable. Inclusive. How might educational systems create a more equitable future? We’ll explore ways innovation in learning can work to level the playing field and drive opportunities in a new economy. From school, to the workplace to the community kitchen, find out and create how new formal and informal education models, tools & technologies to increase unlock human potential, ignite purpose and deepen daily joy.